interactive map of a number of species of birds, showing their migratory flight paths and where they spend their non-migratory time. 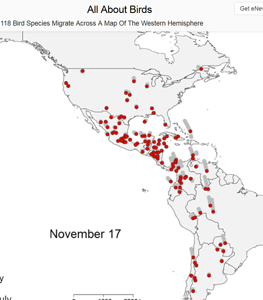 If you spend any time thinking about the migratory patterns of different birds, this map will be a very satisfying experience, as you can visualize the movements of many species over the course of a year and take a look at specific ones that interest you the most. For anyone who finds migration fascinating, it’s difficult to stop watching the movements of all these species across the hemispheres, and it provides an amazing visual depiction of the flyways, vast areas and habitats that birds both travel over and use during the year. But not only does it provide migration and behavioral information, it also shows how important it is that the habitats birds use while nesting, overwintering and en route to both destinations are maintained, and just how disparate some of these habitats are. Don’t miss the migration wave of specific birds like that White-rumped Sandpiper cruising fully north and south and flying way out over the Atlantic (106); and see how a Purple Sandpiper (78) takes a tour of Canada; or a tiny Blackpoll Warbler (15) makes the push to northern Canada from South America. It’s pretty easy to get hooked!